Rick’s Editorial: What if? No Borders, No Sovereignty and No Truth! On January 15th, representatives from 70 different countries will gather in Paris, France for an unprecedented global conference. The stated goal of this conference is to promote a “two-state solution” as the way that lasting peace will be brought to the Middle East. In Israel, there is a tremendous amount of concern that whatever is agreed upon at this conference will immediately be used as the basis for a UN Security Council resolution that would permanently divide the land of Israel and create a Palestinian state. But things would have to move very rapidly in order for that to happen, because Barack Obama’s time in the White House comes to an end on January 20th, and Donald Trump has already made it exceedingly clear that he would never support such a resolution. An Israeli “settler” just said something so good that it puts the Obama administration to SHAME! Daniel Luria lives in a city called Ma’aleh Adumim. After John Kerry’s speech, Luria completely took apart everything that Kerry said and provided the world with the FACTS!! Everything the world thinks about “settlements” and “East” Jerusalem was ROCKED by Luria. Jerusalem is the eternal capital of the Jewish people. Kerry’s ignorance was on total display in his speech. If authentic, the document, leaked to an Egyptian website, confirms some of the claims voiced in Israel against Obama since the UN vote against the settlements last week. Are Jewish communities in Judea and Samaria an obstacle to peace? Are the millions of Arabs living inside Israel obstacles to peace? Join Dennis Prager of Prager University as he gives a lucid and knowledgable synopsis of the Middle East conflict. Although his explanation is based on historical fact, these facts are becoming murkier and murkier as the Moslem countries of the Middle East attempt to rewrite them. Turkish President Tayyip Erdogan said he has evidence that U.S.-led coalition forces give support to terrorist groups including the Islamic State and Kurdish militant groups YPG and PYD, he said on Tuesday. “They were accusing us of supporting Daesh (Islamic State),” he told a press conference in Ankara. The Israeli government says that the Obama administration actively pushed for the adoption of the UN resolution condemning Israel on December 23, a claim that the Obama White House unconvincingly denies. On Fox News’ “America’s News HQ” Sunday, a spokesman for Prime Minister Benjamin Netanyahu accused the United States of pulling the strings in last week’s developments at the UN Security Council. t is Islamist-leftist dogma that Israel’s millennia of attachment to its homeland count for nothing. Adding a final shameful chapter to a foreign-policy record that already runneth over with them, Barack Obama on Friday abandoned America’s commitment to Israel’s security, and to the vindication of democracy over sharia-supremacist aggression. In an act of cowardly venom, the president had the United States abstain from — and thereby effectively enact — a United Nations Security Council resolution that condemns Israeli settlement activity. In an absolutely stunning editorial for the New York Times, former President Jimmy Carter has publicly called for Barack Obama to divide the land of Israel at the United Nations before Inauguration Day. 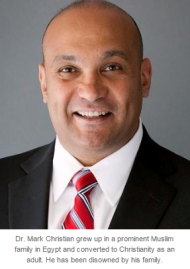 Dr. Mark Christian grew up in Egypt the son of a Muslim Brotherhood spiritual leader, physician and military officer, with all the privileges and pressures that came with that elite status. By the age of 12 he’d memorized more than 70 percent of the Quran. He was a child imam who studied in Cairo’s best madrasas and was being groomed for his own career in medicine. He idolized his father and earned his trust by studying the Quran day and night. He attended mosque regularly and soon found himself answering religious questions from men more than twice his age. Snaking through the vast stacks of Quranic knowledge stored up in the boy’s mind was the asp of anti-Semitism, the idea that Jews were a festering problem, a hindrance to Allah and Islam. To Mark, as with his father, Israel was a cancer in the Middle East that needed to be removed. Today, will go down as an historic day both for the United States and Israel, some good, some bad. Vice President Biden, President of and resides over the Senate. Although he had plenty of notice of the Prime Minister’s visit, he elected to leave the country this past Sunday and will not be in attendance. American Ambassador to Israel, Daniel Shapiro, following President Obama’s order not to attend. ‘NO’ member of the Obama Administration, following President Obama’s order not to attend. Meaning, not even a Cabinet member. Congressman Keith Ellison, D-MN, was the first Muslim elected to Congress and for obvious reasons, will not attend. Thirty (30) Democrat Congressmen/women will not attend because they say protocol was broken by inviting the Prime Minister. Is that the real reason? Really? A number of members of the Congressional Black Caucus have pledged they will make a scene and disrupt the Prime Minister during his speech. Sadly, for all the world to see. How insulting would that be for one of the ‘Free World’s’ greatest leaders and the American people? Netanyahu said yesterday: “Americans worry about their security, the Israeli Prime Minister worries about Israel’s survival!” Yes it’s true, most Americans do worry about their security and that of their families, I honestly don’t have a clue what our leaders are thinking about! Will the Congressional Black Caucus (House of Representatives) really disrupt Israeli Prime Minister Netanyahu’s speech to the House on March 3rd as they have promised? If they do, it will be a very sad day for America and will confirm beyond a doubt, they will do the President’s bidding no matter how despicable or misguided.